TDmonthly Magazine Products by WABOBA INC. Play life to the extreme. The Waboba Extreme is the most versatile of all the Waboba balls. It is perfect for all open water play at the beach, lake, or even the local city fountain. Its ability to bounce high and fast makes it a fun and challenging water sport to be enjoyed by everyone. With its extreme wow factor, you’ll get attention everywhere you take your Waboba ball. A small step for Waboba, a giant bounce for mankind. The Moon Ball just may be the most extraordinary ball to hit the ground in the history of the universe. And now, you have the power to bounce it out of this world! Well almost. We didn't want to make it bounce so high, it would knock the real moon out of the universe. The Moon's crazy, gravity-defying features will turn a routine game into an out of this world free-for-all on a playground, skate park, gym court or basement. Get ready to expect the unexpected. 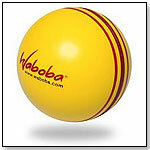 The Big Kahuna is Waboba’s biggest and most versatile Waboba ball yet! Its larger size limits the speed of the ball, making it easy to catch. The Big Kahuna bounces on water only. Take it anywhere! Pools, lakes, oceans, rivers, etc., - great for all water environments. Available in assorted colors. Ball size: 4” diameter. Waboba balls love water. So, we created one to help our friends at +H2O protect it. 20% of each +H2O Waboba ball sold will be donated to support clean water and environmental initiatives. Designed like the Waboba Extreme. The Waboba Surf "Bounces On The Water". 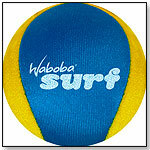 Softer and smaller, and easier to throw and catch than the original Waboba balls that bounce on the water, the Waboba Surf is an excellent item for the toy industry. Perfect for the beach, lake, or river. — Mike Castor, owner of Pentwater Toybox in Pentwater, Mich., told TDmonthly in a late Summer 2012 survey that they sold 200 Waboba Surf balls in three months this Summer. Tosy AFO (Aliens' Flying Object) is a boomerang flying-disc game that lights up when it's dark. uper bright LEDs automatically ignite when launched, creating a colorful rainbow through the night sky or in a darkened play space. A specially designed, hand-held launcher and thin, flexible blades allow the user to control the distance, height and flight characteristics. Pull the launch string and watch it fly; horizontally across the field to be caught by a play partner or vertically to an incredible height, then arcing back to return exactly from where it was launched. Indoors, compete to see how long the Tosy AFO can suspend from the ceiling or against the wall, seemingly defying the laws of gravity.